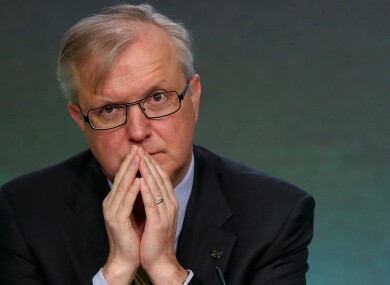 THE FORMER EU Economics Commissioner Olli Rehn has said he will consider attending Ireland’s Banking Inquiry if asked. Speaking to The Marian Finucane Show on RTÉ Radio 1, Rehn said that while he wasn’t familiar with Ireland’s plans to investigate the financial crisis, he would “cogitate seriously” if he received an invitation to appear before it. He was speaking during a discussion of a new book on former Minister for Finance Brian Lenihan, whom he called a “good colleague”. Rehn, now an MEP and European parliament vice-president, was hesitant to answer questions relating to calls to ‘burn the bondholders’ at the height of the economic crisis. He said that Ireland’s requests for this came up in discussions between the ‘the ECB and other key players’ at the time, and that there was “plenty of understandable dissatisfaction in Ireland on this”. “I’m not aware of discussions between the European Central Bank and the Irish Government, which is quite crucial in this context, “Rehn explained. “It is essential that European Union has learnt the lesson of this exercise, and one of the lessons learned is, indeed, the creation of the banking union, where the banking rules are very cleared specified. But, at the end of the day, I would not completely take Ireland itself out of responsibility. The Irish banks also lent rather recklessly during the crisis period. Referring to phone calls between Lenihan and former President of the ECB Jean-Claude Trichet, in which Lenihan was informed that it would be unwise to burn the bondholders, Rehn said he was unaware this taking place. He stressed that in the lead-up to Ireland receiving a bailout, the main worry for “all of the policy makers in Europe, and I dare to say in the world economy as well”, was to stop the contagion effect spreading across the Eurozone. Rehn also recalled that in 2010, at a G20 meeting in Seoul, that he, Trichet, US Treasury Secretary Timothy Geithner, and German Finance Minister Wolfgang Schäuble, decided to place an “immediate” call to Lenihan, telling him to speed up preparations for a bailout. This was despite previous plans for a “organised, arranged rescue operation”. Speaking at the end of last year, ahead of the Government’s celebrations to mark the country’s exit from its IMF/EU bailout programme, Rehn acknowledged that Ireland’s blanket guarantee of its banks was a mistake. Email “Olli Rehn: 'Bondholders partly to blame for Irish crisis... but your banks were reckless'”. Feedback on “Olli Rehn: 'Bondholders partly to blame for Irish crisis... but your banks were reckless'”.